If you've spent any time on Pinterest, you have seen Audrey from Putting Me Together. She blogs about her experiences in learning how to, well, put her self together. She talks about the process of putting an outfit together, and how little changes can make all the difference. I'm so glad she agreed to participate in Behind the Blog! Tell us what motivate you to start blogging. Were you following a lot of personal style/fashion blogs before you started blogging? 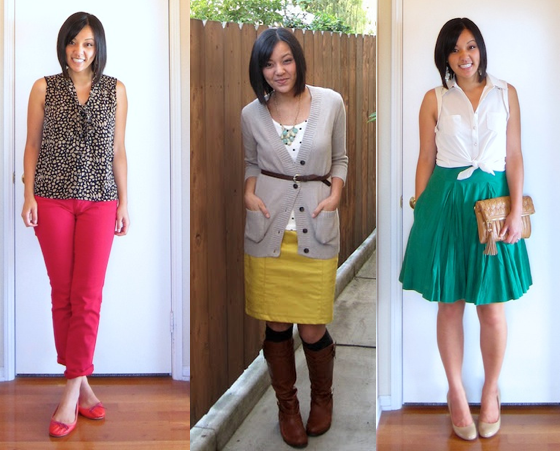 I started my style blog in June 2011, and I had only discovered style blogs two months prior to starting my own. I was an avid fan of What Not to Wear for years, but there was something about style blogs and the style blogging community that was fresh and invigorating for me. I really wanted to evolve my own style, to be in contact with a community of people who cared about style, and to hopefully one day help other women feel put-together and confident about getting dressed. I toyed with the idea of starting my own blog and brainstormed names and potential focuses for it. Even though I didn't feel near ready to start a blog, my husband bought a domain name for me as a little kick in the pants to do it. It worked. Which blogs do you read every day? There are a lot of blogs that I follow regularly and of which I read every post eventually through out the week, but the ones I will always go to every single day no matter how little time I have are Kendi Everyday and J's Everyday Fashion. Who takes your pictures? What cameras/lenses do you use? Have you ever been "caught in the act" of taking these pictures? What programs do you use to edit and upload your pictures? You often times make collages of outfits - what program do you use for that? Again, nothing fancy here. I edit pics using Preview on my Mac. As for collages and other graphics, I'm a little embarrassed to tell you how shoddy things are around here--I use Pages on Mac, take screenshots, and save them as jpegs! I toggled between using Pages and Pixelmator, but Pages is just so much quicker for most of the stuff I need. I used to play with Photoshop in high school, but Pages, Preview, and occasionally Pixelmator have gotten the job done so far. Do people in real life know about your blog? What were their reactions when they found out about your blog? Ha! I've had a blog for over a year and I still try to keep it a secret from most people I know. But as my blog has been growing, I probably have at least two people I know in real life tell me they found my blog, EACH DAY. I'm learning to just brush it off, say, "Oh, haha, cool!" and become sneaky and savvy at diverting to another subject. You've documented the act of "putting yourself together" for over a year now. What are some of the biggest closet and clothing lessons you've learned? Oh gosh! 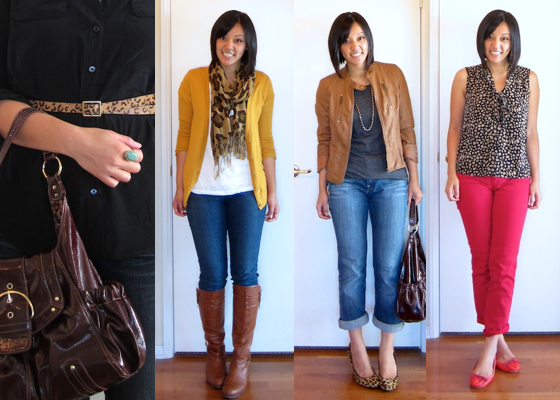 Definitely how to have a mix-and-match wardrobe through buying the right pieces and learning to accessorize. I have so much to say about this that I wrote a whole series on it: Building a Remixable Wardrobe Series! Many fashion bloggers hop from one trend to the next. How do you try to stay on trend while working within your budget and closet? I believe you can have a great sense of style without having to follow trends. I usually don't go looking for trends because, but I do sometimes participate in them--usually on accident. Usually if I see something that I like in magazines, blogs, or Pinterest, I will go for it whether it's on trend or not. In fact, if I know it's on trend I'm more cautious about it and I'll try to evaluate how long it's going to be around for and if it's worth investing money into. If I know something's a trend and I want to try it, I will look for it at Forever 21 or at a consignment store. I got my first pair of colored jeans (the ones below) and my first two colored skirts at a consignment store, and I ended up sticking with them and growing my collection! Also, every fall you hear that animal print is "in" but I honestly don't think it ever went away. In my mind, animal print is a classic. However, I was unsure if animal print was good for me, so I started with something small, like a belt. Then I got a leopard print scarf and ended up loving it. I ventured out into leopard pumps, and then got an animal print top. I'm totally on board with it now! Putting yourself on the internet comes with the expectation that not everyone will always love what you are wearing and writing. Have you encountered any of these criticisms, and if so, how do you handle it? It can be really scary if you give it too much thought. People are meaner on the internet, you know? But personally, for the most part, people have been pretty polite and respectful, though I have gotten a bit of criticism. A couple have been ridiculous--like someone telling me that one of my eyes was deformed and that I should get surgery. When things are that ridiculous, you just have to brush it off and assume it's a 14 year old with nothing better to do. And even if they are an older person, one who acts like a 14 year old doesn't deserve your attention. Others have been more polite and respectful with their criticism, saying they don't like my shoe choice or something. But the way I see it, style is subjective and everyone will have a different opinion. And at the end of the day I have to remind myself that the goal of me posting is not to make other people love my outfit. I'm trying to dress for ME, so that I feel confident and comfortable. If other people love it, that's a bonus. My style is not everyone's preference, so of course there are going to be outfits I wear or parts of my outfit that someone will dislike. That's what personal style is--the expression of yourself through what you wear. And if everyone liked the same things then we wouldn't be uniquely us. If there's something someone doesn't like no one is asking them to like it or wear it. And if they'd prefer a different shoe or cut of pants, then that's great! They should wear that shoe or pant--that's how you personalize your style. But I try hard to resist the pressure of having to dress in such a way so that everyone will love my outfit. That takes the fun out of blogging and getting dressed. What has been the best thing to come out of blogging? Learning to be more myself. Though I wouldn't say that I was marked by insecurity pre-blogging, the comparison game is heated in style blogging. I had to fight to not try to be like other people and just be ME. I wrote about it here. When it comes to promotion of your blog, what methods do you use? Do you spend a lot of time commenting on other blogs, pinning your looks, doing link ups? Early on in blogging I decided that I didn't want to have anyone reading my blog with "strings attached," meaning the kind that would only read my blog for something in return besides content. I sometimes leave my URL when I comment on blogs (and used to do that a lot more earlier on), but I was never the type to ask to follow each other. I wanted readers who genuinely wanted to read my blog, so I tried not to do anything gimmicky. That's why I also don't usually require people to follow me for giveaway entries. I just want readers who genuinely want to be there. And I've never pinned my own look--mostly I focused on trying to create good, consistent content. And then I think I got kind of lucky. Other people started pinning things from my blog and mentioning PMT on various forums and somehow my blog grew to what it is now. What tips or suggestions do you have for your fellow bloggers? Number 1: Know your target readership, and be specific. Whether it's a style blog or a lifestyle blog, who are the types of people you want to write for? I really hoped my blog would be a resource to the woman that has trouble with style and has no clue how to put together an outfit. For me that meant I wasn't going to let myself worry about attracting or impressing the people looking for high fashion dressers or creative or unique dressers. It was hard, because that's what many people look for in a style blog and sometimes I felt kinda stupid being a style blogger with such a "simple" style, but I learned to be myself and share my heart of wanting to help other women in a very down-to-earth way. It took a while, but I think I finally hit the niche I was hoping to write for, and I love it! I love helping people, not just showing off my newest purchase or having an audience to express myself to. I love all of the emails I get telling me how PMT has helped women feel great about getting dressed! Number 2: Be true to yourself and finding your voice. You hear this a lot, but I cannot stress it enough. In blogging there is always the temptation to be like someone else. Of course! We read blogs to be inspired, so it's natural. But it's not helpful when you start to lose that sense of who YOU are, here and now, because you're trying to be someone else. My favorite quote right now is this Dr. Seuss quote: You are you / This is truer than true / There is no one alive / Who is youer than you. I took it to heart, and I believe I'm a freer person and a better blogger for it. Thank you Audrey! I'm skipping next week's Behind the Blog because we'll all be in a food coma, but on the 29th we'll have Laura from Twelve by Six!